California State University, Fullerton offers the only Graduate Certificate in Human Resources Management in Southern California from a fully-accredited business school. Courses may be transferable to a Master's Program. Superior human resources management can provide a significant competitive advantage. Human resources managers need to be viewed as fulfilling an integral and strategic role in the organization. Our graduate certificate allows mid-career HR professionals to propel their careers to new heights. Offered in connection with the Mihaylo College of Business, a dual-accredited business school, this program's courses are transferable to the MBA program. Students are welcome to apply and take one class, or the entire program. In this Q&A, Dr. Pichler talks about program benefits, the value of participating in a diverse learning community, and advice for incoming students. 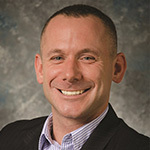 Dr. Shaun Pichler (Ph.D., Michigan State University) is a tenured associate professor of management at the Mihaylo College of Business & Economics at California State University, where he teaches courses in organizational behavior and human resource management. Shaun maintains a thriving management consulting practice, and works with organizations from a variety of industries across the United States on topics such as diversity management, human resources management, performance management, among others. Prior to pursuing his doctoral degree, he worked human resources at the American Hospital Association in Chicago. He did so while earning his M.S. in human resource management from Loyola University, Chicago. Shaun has published sixty-two (62) articles and chapters in premier outlets such as Human Resource Management, Journal of Occupational & Organizational Psychology, Journal of Vocational Behavior, the Oxford Handbook of Human Resource Management, and Personnel Psychology, among others. His research has been cited more than 2,300 times, and has been covered in a variety of prominent national (e.g., Forbes) and local (e.g., O.C. Register) media, as well as variety of other outlets including the U.S. Congress and many policy reports. Shaun is an editorial board member of several top journals in his field, such as Equality, Diversity, & Inclusion, Human Resource Management, Journal of Vocational Behavior, and is an Associate Editor for Journal of Occupational & Organizational Psychology. Shaun has won numerous teaching, research and service awards, and was the Mihaylo College of Business Faculty of the Year in 2015. Shaun’s passion is translating cutting-edge research into evidence-based consulting and education. Cases, problems and significant personnel administration literature in personnel administration and human relations. Understanding and predicting human behavior to enhance individual, team and organizational performance. Applying effective principles of motivation, team building, influence, leadership and conflict management. Develop executive-level capabilities to lead, manage and implement organizational change. Build change leadership skills through exposure to a variety of industries, organizations and decision-making scenarios. Dr. Deborah Ferber has over twenty years of executive management experience in Human Resource Management & Development and Entrepreneurship. She considers the most important job she has ever had is assisting students on their career goals at California State University, Fullerton. She has held C-level executive positions and her passion is coaching organizations on best practices and benchmarking for Human Resource Departments. Some of the organizations she has worked with and learned from include Kelly Paper, Deutsche Bank, KPMG, US Navy, 20th Century Fox, Warner Brothers, Allstate, Xerox, Ingram Micro, IBM and Microsoft. Dr. Ferber has received a number of awards for business and community service work, such as the Melvone Jones Fellowship, 2000 Notable Women in America, the Spirited Entrepreneur Award from the OC Register, and the Lions Club International President of the Year. Her HR specializations are recruitment, retention, training, and benefits. She has written books and has been published in national and international publications. She continues to keep her business skills sharp by sitting on boards, presenting on radio, TV and lecturing on business topics to international trade organizations. To apply to our Graduate Certificate in Human Resources Management Program, complete the form and upload required documentation. Applications are due May, 10, 2019. Join our email list! By joining our email list, we will send you important program updates and let you know when registration is open for the program.